An excellent depiction of what happened on that fearful day, but poorly shown cinematically. 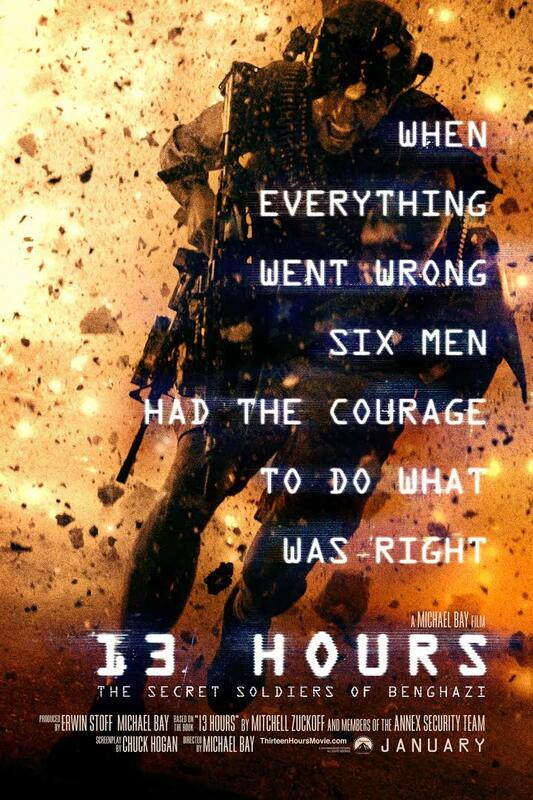 13 Hours: The Secret Soldiers of Benghazi is the latest Michael Bay film. Like a true Michael Bay experience, he wows audiences with spectacular battle scenes, stunning visual effects and sound design, and massive explosions; but, with that comes a sloppily handled ensemble cast, underdeveloped pacing and structure. Even though it was at first surprising that a Michael Bay film was getting a January (cinema graveyard) release, after screening it Tuesday night, it is evident why it received this slot versus a summer release. Although we are still learning about and experiencing the ramifications of what happened on that September evening, even though this movie definitely lacked in overall direction, I feel strongly that with what limited information has been released regarding this tragedy, Bay was able to translate the news footage, transcriptions, and government documentation to the screen in terms of capturing the visceral horror and terror that befell the CIA, special operations teams, and the Libyan Ambassador. Michael Bay’s 13 Hours: The Secret Soldiers of Benghazi is about the tragic events in September 2012 that caused the deaths of an ambassador, CIA personnel, and ex-military special operations stationed in classified compounds in the Libyan capital of Benghazi. Get a glimpse into what it must have felt like to experience one of the most horrific tragedies since September 11, 2001. In this biographical war thriller, go behind radical, militant Islamic enemy lines and follow a band of six soldiers who took the initiative and disobeyed orders in a valiant effort to rescue US CIA and Consulate personnel from certain death. Given that this is–or at least seems to be–an accurate depiction of the attack on the US Consulate and CIA Annex in Benghazi, one of the most conspicuous absences is any mention of President Obama or then Secretary of State Hillary Clinton. Obviously this film was not produced to evaluate the actions of the President and Secretary of State, their respective roles in this attach are indirectly an important element to the narrative of the film that should have at least been mentioned. When a filmmaker, especially one of Michael Bay’s caliber, takes on the daunting task of translating a real war-time event to the silver screen, it is important to include the notable individuals who contributed to the success or failure. Knowing that the focus of this film was on the six ex-military special forces, it was not necessary to focus on the Presidential cabinet’s actions, or lack thereof. Still, it should have been included on some level. Like with any Michael Bay film, you are going to get amazing cinematography, visual effects, sound editing, and EXPLOSIONS; but, this biographical thriller lacks adequate pacing and plot structure. Furthermore, it is unlikely that the audience will feel any strong emotional connection to any of the characters in the ensemble cast. One thing is for sure, most people watching this movie will definitely hate the enemy. But, a movie like this one needs to go beyond a nearly unified hatred of the radical, militant Islamic terrorists and cause the audience to develop strong feelings and connections with the central characters. Despite having a slight connection to one of the soldiers due to witnessing his interactions with his family back in the States, Bay fails to further develop him or the other characters in terms of growing the relationship between the characters and the audience. Although there are deaths of great significance in this movie, it is likely that none of them will be tearful or pull at one’s heartstrings. I feel that this film had potential to be another American Sniper or Saving Private Ryan but failed to include the emotional connection to the central characters and appropriately pace the film. It really isn’t the narrative in and of itself that is lacking–there is certainly a good story there–but the poor pacing and underdeveloped characters combine to occasionally cause the audience to feel lost in the events. Thankfully the film includes timestamps and locations to help the audience follow the course of events that lead up to the attack on the consulate. The sheer realism of the attack is incredibly impressive. There are even some shots that look very similar to the bombing of Pearl Harbor in Bay’s Pearl Harbor. Bay was successful at effectively combining the best of practical and visual effects to create an immersive experience for the audience. Whether you come from the position that the CIA showed rampant incompetence, coupled with a lack of action from the President’s cabinet or you feel equally strongly that the CIA and President’s cabinet made the best decisions they could with the information they had, this film brings a recent war-time tragedy to life for the silver screen. You will definitely feel like you are in the midst of the action and get a feeling for what it must have been like for the soldiers to go against orders from the CIA to do what they felt was the right thing. For those who appreciate and thoroughly enjoy military or war movies, then this film is definitely for you. Because of the fantastic technical direction of the film, it is one that can be enjoyed by just about anyone. Despite the fact that it definitely has areas in which it greatly lacks, it is definitely visually driven and communicates this attack with realism.